Transparency Market Research (TMR) states that the leading players in the global pain management therapeutics market are Pfizer, Inc., Merck & Co, Inc., Johnson & Johnson, Endo Health Solutions, and Purdue Pharma LP. “The competition is projected to intensify in the coming years as several manufacturers are likely to be threatened by the entry of generic drug manufacturers,” stated the lead analyst Despite the cutthroat competition, Purdue Pharma LP and Pfizer, Inc. held a 50% share in the global market in 2015. The World Health Organization states that the rising cases of cancer across the world have provided the global market for pain management therapeutics lucrative opportunities. The disease comes with immense pain, which makes life miserable during the treatment as well as after the treatment. These therapeutics are also administered to those who are terminally ill patients who no longer have the strength to fight the pain. Owing to this reason alone, the cancer pain management segment held a share of about 28% in the global pain management therapeutics market in 2015 in terms of revenue. Geographically, the global pain management therapeutics market is segmented into Asia Pacific, Europe, North America, and Rest of the World. Of all the regions, North America dominated the global market as it held nearly half of the market in in 2015. The efficient healthcare sector of North America, rising expenditure on healthcare, and high level of awareness among patients are expected to fuel the progress of this regional market. Europe is expected to closely follow North America pain management therapeutics market as the region works toward offer better healthcare. The growing pool of geriatrics, who are susceptible to a wide range of diseases that can be painful, have been the key consumers of pain management therapeutics in recent years. Arthritis, epilepsy, nerve damage, depression, cancer, diabetic neuropathy, and several other injuries that are seen among the aged are projected to drive the global market in the coming years. The global geriatric population is estimated to reach 2 billion by the end of 2050, raising the demand for pain management therapeutics by leaps and bounds. The market is also being favored by the growing investments in research and development of new molecular combinations and improved methods of drug delivery. The supportive regulatory reforms that are in support of the drug development are also expected to set the global pain management therapeutic on the path of growth in the near future. 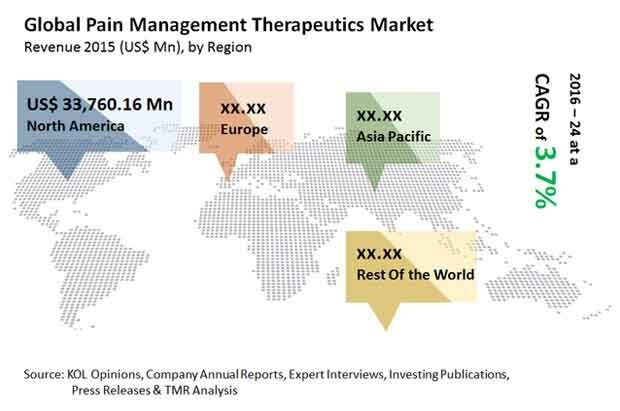 Despite the strong market drivers, the global pain management therapeutics market faces some tough challenges. The expected expiry of blockbuster pain management drugs is likely to hold back the sales for several big players in the market. The inroads by generic drugs will also restrain the sales of high-earning drugs by providing affordable alternatives to patients.